New Elite Backer Alpha, New Gameplay Video, Release Window Adjustments, Development Updates, PlayStation Experience & GIFs! We’re happy to share that Sony has invited us to this year’s PlayStation Experience, hosted in Anaheim on December 3 & 4! We’ll be bringing a fresh new demo of Heart Forth, Alicia for attendees to dive into. We’ll be showcasing it at our little part of the show floor, in booth B1001. We love meeting fans, so drop by anytime! We will also have a few beautiful HFA posters to give away. If you work for a press outlet and you’d like to take the demo for a spin, reach us at hfapress@alonsomartin.mx to set up a meeting. Just to pique you interest, this demo will let you choose between an action-heavy dungeon and a more narrative focused section. Both options showcase the game’s visuals, cutscenes and gameplay, so don’t miss out. In the gameplay video above, Alicia explores and fights through an atmospheric and treacherous area in the Verillion Trail, East in the Valley of Ëliadin. This specific area is found early in the game, and although parts of it are meant for more experienced players, the game doesn’t stop you from trying to reap the hidden rewards… if you survive! This is actually the first video of uninterrupted gameplay we’ve released in a long while. If you haven’t played any of the game’s alphas or demos, it hopefully illustrates what it’s like to play the game today. It feels great to finally give you a peek into some of the improvements we’ve done to the game over the years. We’ll continue releasing more of these in future updates. We’ve got a new alpha build ready for you to try! And it’s available for download as we speak at the Backer’s Club. Like all alphas, there’s some content you might’ve seen before, while all the new content specific to that build is found in the latter parts. The sharp-eyed among you will see that we’ve reorganised, expanded and polished all previous content. There’s also a hefty amount of new story for you to explore, laying the groundwork for Alicia’s journey. There’s a ton of changes and improvements that have gone into this build, so we really hope you enjoy it! Note that this is an alpha for Elite Backers ($150+) and upwards. Make sure to click on the “Unlock Content” button to reveal your downloads, where you’ll be able to read all about the newest builds we’ve prepared for you. If you still haven’t claimed your Backer’s Club account, enter your email here and you’ll receive instructions. You can also make address changes in your profile page. After our trip to PSX, we’ll focus on getting the next two sections together for the next alpha. There’s internal testing and gameplay adjustments to be made for those, but we’ll keep you updated as we move forward with them. Click here to download the latest Elite Alpha build! Beyond work on the new Elite Alpha build, a demo for PSX and another one for IGF 2017 we’re currently at work hammering out any bugs and adjusting level design throughout the first half of the game. Once that process is finished, we’ll shift our scopes to the second half of the game as we continue to develop the last 3 big game areas. The music, environment & enemy graphics for these areas are 70% complete, but we still need to work on creating, building and coding the necessary rooms, puzzles and boss battles. Our last update on the release date target was last November, where we forecast we’d have a near-finished version of the game around this time. Despite our committed work, even as we draw closer to the finish line with each passing day, we are not at that stage yet. I know delays are never welcome. Making a game of this scale is a gigantic endeavor that has demanded many willing sacrifices, and though I do outsource part of the game’s content to ease the load, HFA’s core vision is still being fleshed out by one person. Games tend to be delayed for a number of reasons. In our specific case it’s mainly because we don’t want to cut corners. We need to take our time to get things done the way they’ve been envisioned. Having said that, we are forging ahead as fast as we can; I’m personally working 12+ hours a day including weekends to get things to where they need to be. There’ll be over 100 of these upgrades hidden across the game world. Will you find them all? We also recently opened a discord server just for Heart Forth, Alicia. Click on the link below to chat with us or with your fellow backers! This shoutout is going to be a special one, and also an unconventional one because it’s not really for another Kickstarter campaign, but for a game that’s very recently been released. 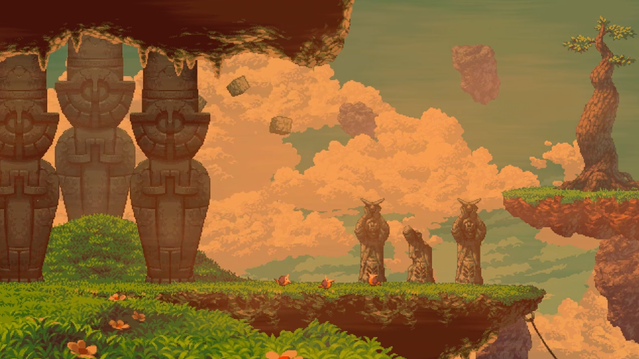 Owlboy is a platform/metroidvania game that was in development for 9 years! (HFA’s long lost brother, maybe?) It absolutely shows how much love went into it. I’m so proud of these guys for finally releasing their dream project, and we can’t help appreciating the enormous labor of love that this game was. We wish them all the success in the world from our heart of hearts, they deserve all the good things coming to them! Head to their Steam page below, enjoy their beautiful trailer, and if you like what you see consider supporting this team of super talented developers. Hey, I’m not a backer but I’ll surely get this on day one! I’ve been expecting this game for the past 2 years, it’s really exciting to see so much love and dedication into making it a memorable game. – Intended to play it on PS4, but I just got a Vita and it seems perfect for HFA. Hope this version won’t be canceled like happened to Hyper Light Drifter. – Roughly, how long will HFA play? I mean, looks like there’s lots of content and narrative, while games like Guacamelee and Ori, though excelent, took me only 10h to 100% them. I hope for some lenght more to the likes of Salt and Sanctuary (20 marvelous hours). Lets hear about an update to the release date, last that was dropped was middle of 2016. Time to keep your backers clued in. Game balance is one of the most difficult things. In the kickstarter blog you told about gameplay statistics. Statistics are good, but don’t aim to perfectly flat or “balanced” curve. Things should vary, difficulty should vary. It doesn’t always need to be a smooth curve from easy to difficult. Has anyone from your team team played Ori and the Blind Forest? It’s very good in many things like game play mechanics, but it was quite flat and predictable. Enemies, rooms, secrets, everything was pretty similar, they felt the same, the design of everything were the same regardless of different themed areas. In some way it makes the game feel coherent and establishes the feel and atmosphere of the game which is one of it’s strong points, but it makes the gameplay bit boring. Dark Souls’ level design and balance (in some cases you could say imbalance) is amazing. In some places you just get completely devastated and find that you need to try completely different approach. A bit figuratively, in Ori you just go forward the same path, overcoming and dodging any hindrances that come along it. In Dark Souls, you need to adapt and sometimes completely change how you do things. For example, in some cases a careful, defensive approach is better, in other cases it doesn’t work and being aggressive and beating an enemy quickly is what works best. In some places you’d better run to a better place and then kill enemies that are following you. It’s not just going forward, beating enemy after enemy until you are at the end. There are areas that feel very dangerous all the time and areas that have stronger spikes of difficulty, but there being lot’s of room. Then Dark Souls 3 came. It’s still very good game and in many things better, but it definitely is a bit flat. Areas and enemies look different but all play very similarly. There is lot’s of good level design, but it’s all similar level design, having same things scattered thorough the game. The same, small set of approaches work everywhere. So, don’t be afraid to make some strategic imbalance. If some game area or enemy stands out some way, you don’t necessarily need to “balance” it out, maybe you should rather amplify this trait. The feeling with many modern games I get is that I can play trough them without thinking, even if there are more optimal ways to do things, doing it the unoptimal way (that often has some other advantage like less use of resources), I get through it without changing anything. Then in some games there are normal things that can be done normally, but then this thing needs to be done like this and that thing like that or it won’t work at all. In my opinion, it should be that for each situation, most things work but some things being more risky or safe, and using different amount of resources like hp and mana. This is also related to area designs, in some places you lack some specific thing more than other and you need to decide how to manage with it. Some areas could have very deadly enemies, some areas are very long and you are constantly low on everything. One thing I’ve noticed in modern games is that there are too much save points and safe spots or a way to always get safe if things get too hard, or a revival backup mechanic or something like that without much consequences. The line of failing needs to be drawn somewhere. There’s almost nothing to risk, nothing to lose and getting back to try again is only a matter of minutes or even seconds. A situation where you think “I definitely don’t want to die now” are rare. For a game to be good, good individual game mechanics aren’t enough if the game needs zero player investment and actual trying. Often you can just brainlessly go forward and not care for anything, if you fail then you change something and try again. Trying to play well should be rewarded, not caring about anything should be punished. There should be tension and motivation to not fail. Most games completely lack it, and even if there is some, it’s very soon reliefed. In Dark Souls 1 I remember the Catacombs. The dungeon was full of traps, and it just went on and on. And when you were almost dead and expecting a bonfire (save point), you get a door to boss instead. After the boss, carrying lots of souls (that you drop when you die), there’s still no bonfire but a beginning of a pitch black dungeon. At this point you can teleport back though, and find a short, more optimal way to skip many parts of the catacombs. This is great design and makes the game engaging and satisfying when you succeed. That was a lot more text than I first thought I’d write. Some of them might apply and fit to HFA, some of them probably won’t, but try not to fall in some of these traps in the game area design and balance.